The Park Smart® Stick-On Door Guard is the ideal preventative measure against Door Dings and Chipped paint. The soft nearly invisible Door Guard helps cushion even the hardest of blows. 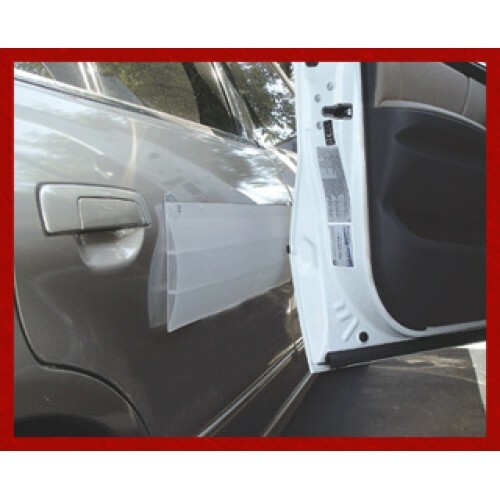 The smooth suction cups hold the Door Guard onto vehicle without scratching the paint. Comes with a Lifetime Warranty. RaceDay Peel & Stick Garage Floor Tiles - Diamond Tread - 24"
RaceDay Peel & Stick Garage Floor Tiles, Diamond Tread - 24" Garage Flooring Tile Dimensions - .. Hanging Door Guard The Hanging Door Guard measures 25"x 6.5"x 1.25" The Park Smart Hanging Doo.. The Parking Mat measures 27.5"x 12"x 1.5". New and Improved, So Strong even a 17,000 lb. Forklift ..
Park Smart Stick-On Door Guard The Park Smart® Stick-On Door Guard is the ideal preventative me..